Wife, mother and newly published author of a fantasy/fiction that took almost 30 years to get published. and the faithful Son who stands in his way with the woman destined to share his throne. Who shall emerge The Victor in this epic battle between good and evil to rule the lives of hapless men? Inspired by an Amy Grant song called "Fairytale" from thirty years ago and in the rich tradition of J.R.R. Tolkien and C.S. 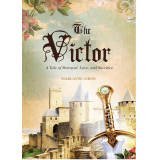 Lewis, The Victor is an action packed adventure novel of love, friendship, betrayal and sacrifice set in medieval times. Your girls will love the romance of rescued love while boys will devour the scenes of jousting, knights and battles. Using ancient literature as the template, The Victor teaches lessons of enduring love, loyalty and reward in an exciting drama laced with unforgettable characters. Amy Grant autographed the author's copy and has one of her own.